So..Do you believe in FATE? Office coffee times are amazing, gossipping mostly 🙂 But sometimes we hit on rather serious topics, and one such question – whether we believe in fate? Fate,Destiny,Life and God are closely associated.Being a firm believer of Islam,I believe in the supreme power above us.But still when people ask whether I believe in fate,I wonder whether I do.Problem is everyone has their own concepts about all of these. You may hold fate responsible for your failure,but take the credit yourself over the victory. Doesn’t make sense,right? We say that everything,both good and bad things happen for a reason. But if God wanted to, he could stop all the bad things.Everyone in this earth would believe in him,and continue living as he wants.There would be no terrorists or rapists or prostitues. Nobody would go to hell. Infact there wouldn’t be any need of a hell if everything goes so smooth. Fortunately or unfortunately that’s not how it is. He has created all of us different – in looks, thoughts and talents. He has blessed all of us with the ability to understand and reason, with enough knowledge to differentiate good and bad,right and wrong. Having said all that,I still think there are certain things in life which are beyond our control. But marriage is not a blessing for all.A friend got married to a pshycho for no fault of hers’. A couple whom we know, were not blessed with children.No fault of theirs’.But later adopted an orphan girl and changed her life for the good. So I still stand confused and cannot conclude properly on what fate is. Though thy has not fully handed over the control of our lives to us,he has not fully taken the control from us. Some predetermined course exists,while some is left to our choice. Ultimately our karma would matter.He has given us the cards to play.It depends on us how we play with it and win the race. 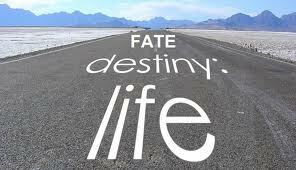 Destiny stand not as a chance but a choice.Life is what we make of it. 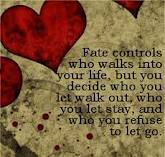 So what about you..Do you believe in fate? Dec5December 5, 2011 • By zradar • This entry was posted in Culture & Religion, My thoughts & Interests and tagged culture, destiny, fate, god, premonition, religion, ultimate truth, you believe in fate?. Bookmark the permalink. I dont believe in Fate..I have always believed that fate is an excuse made by people when things go wrong in life..
like that picture said,we have the right and ability to decide who and what to stay in and out of our life..
my mom used to say that life is full of chances..its a yes or no game..you do X,you end up at A and you do Y,you end up somewhere else.. I dont know myself whether I believe in fate or not. But I believe that everything in life happens for a reason. Personally I feel , Its the difficult times in which I have learned the most.